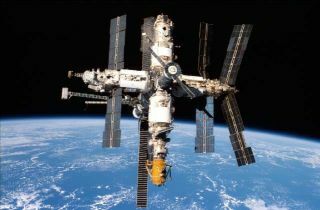 Russia's Space Station Mir: The First Space Tourist Hotspot? This story is part of a SPACE.com series to mark a decade of space tourism. Coming next: A SPACE.com reporter looks at what it feels like to launch in a rocketship. When Dennis Tito, a multimillionaire businessman from Los Angeles, blasted into space aboard a Russian Soyuz capsule in April 2001, he made spaceflight history as the first space tourist to pay for a space adventure. But, depending on your definition of a "space tourist," Tito may not have been the first. Toyohiro Akiyama, a Japanese journalist, and Helen Sharman, a British chemist, were private citizens who were selected to travel to the Russian space station in the early 1990s. While Akiyama and Sharman are often not considered space tourists because they did not pay for their rides themselves, these intrepid spaceflyers helped pave the way for the space tourism industry that is taking shape today. Akiyama was a Japanese television journalist who made history in 1990 by embarking on the first commercially organized spaceflight to the Russian space station. Akiyama launched toward Mir on a Russian Soyuz spacecraft on Dec. 2, 1990, also becoming the first person of Japanese descent to fly in space. Akiyama was selected out of a pool of 163 candidates to make the historic flight and complete cosmonaut training, after a deal was struck between the Soviet Union and the Tokyo Broadcasting Service (TBS). TBS reportedly paid $12 million for Akiyama's seat on the flight, of which $4 million came from sponsorships. Akiyama spent a week on Mir, returning to Earth on Dec.10. During his stay on the station, Akiyama sent back daily reports of his surroundings and life on orbit. Sharman, a British chemist, was 27-years-old when she launched into orbit in a Russian Soyuz capsule. On May 18, 1991, Sharman flew to Mir after 18 months of cosmonaut training in the Soviet Union. One of the requirements of the contestants was a scientific background, and Sharman eventually won her place over 13,000 total applicants. She became the British member of a Russian scientific space mission called Project Juno. During her weeklong stay at the station, Sharman carried out several experiments, and she returned to Earth on May 26, 1991. Ultimately, the companies that made up the Project Juno consortium failed to raise the promised amount of funding for the flight, and the Soviet government had considered canceling the mission, but it was carried out through completion. After 15 years in space, the Mir space station was decommissioned and was sent plummeting into the Earth's fiery atmosphere on March 23, 2001, where it disintegrated into pieces over the South Pacific Ocean.